Prishtinë, November 22, 2018 – Despite the fact that the implementation of Stabilization and Association Agreement (SAA) facilitates the export of Kosovo products to the EU countries and enables access to the European markets exempted from any customs duties, Kosovo faces difficulties and barriers on implementing it. 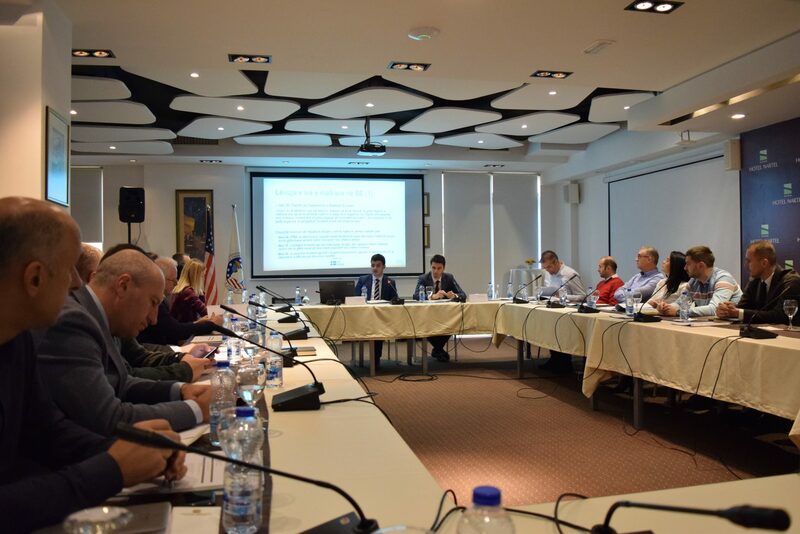 This was said in the workshop organized today by the American Chamber of Commerce in Kosovo, within the project “Private sector development through SAA implementation”, financed by Swedish International Development Agency (Sida), managed by Kosovo Civil Society Foundation (KCSF). Visar Hapçiu, Head of AmCham Economic Research Institute, informed the participants on the European Union structures and mechanisms on free movement of goods within the EU member countries, where exporters have equal treatment, their products being traded in various markets with duty-free treatment. Hapçiu said that the harmonization of the national legislation results in free movement of goods, avoiding national barriers and sets conditions and rules for movement of goods in concordance with the norms and rules that focus on consumer, environment and competition protection. He added that the customs union, promoting standardization, mutual recognition, and the principle of non-discrimination are essential mechanisms in trade and exports development within these countries. Albion Ujkashi, AmCham Policy Officer, said that besides facilitating exports of goods from Kosovo to the EU member countries free from customs duties, the implementation of the Stabilization and Association Agreement also stimulates free economy and economic integration, investment in quality infrastructure and foreign direct investments, mutual recognition of goods, etc. He said that besides the fact that most businesses believe that the fiscal environment has improved significantly since 2014, it is a growing concern that only 6% of businesses say that the local institutions have been effective on the implementation of SAA, therefore more should be done in order to avoid export barriers for businesses of the private sector. Further on, the participants in this workshop addressed the challenges they face on exporting their goods in the region and EU countries, calling upon institutions to be more active on the SAA implementation.